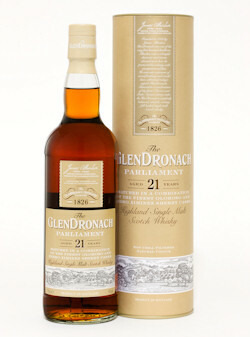 GlenDronach is augmenting its award-winning range of Highland single malts today (October 7) by unveiling its new 21 year-old “Parliament” expression. Matured in a combination of the finest Oloroso and Pedro Ximinez sherry casks, the “Parliament” both complements the distillery’s core range and continues the great GlenDronach tradition of offering fruit-laden intensity in its single malts. The 21-year old – in appearance deep amber with a cherry wood sheen - joins the Aberdeenshire distillery’s existing 12, 15, 18 and 31 year-old expressions. The new expression is named “Parliament” after the colony, or “parliament” of rooks that have been nesting in the trees overlooking the GlenDronach distillery for almost 200 years. At 48% volume, the “Parliament” offers an incredible concentration of aromas. On the nose, appropriately for an October launch, it’s a delicate mix of ripe autumnal fruits - notably blackberries and red plums with rich Oloroso sherry and candied orange segments. Spiced oatmeal biscuits and toasted oak fragrances add excellent weight and balance. And on the palate, the taste is sublime. Billy Walker’s tasting notes detect flavours of fine Oloroso sherry and bitter chocolate sauce “which has been spread liberally over homemade plum pudding”. He adds: “This is all infused with fabulous spicy notes - cinnamon, allspice and nutmeg.” Full-bodied with smooth tannins, the finish, he notes, is characteristically long and lingering.